. إن الخدمات التي يقدمها شقق ذا شور بيتش فرونت تضمن للنزلاء إقامة مريحة. يقدم هذا الفندق العديد من الخدمات الكفيلة بإرضاء أكثر الضيوف تطلباً. تتضمن كل غرف النزلاء وسائل الراحة والتسلية المصممة خصيصاً لضمان الراحة القصوى للضيوف. يمكنك طلب اللائحة الكاملة للخدمات في الفندق ومن بينها مسار جولف - ضمن 3 كم, حمام سباحة خارجي, سبا, حديقة. يشكل شقق ذا شور بيتش فرونت بخدماته الراقية وموقعه الممتاز، قاعدة مثالية للاستمتاع بإقامتك في جولد كوست. يُرجى ملاحظة أن هذا العقار لا يقبل حجوزات من الطلبة. Excellent location, absolute beachfront close to everything yet away from the hustle and bustle of Surfers paradise noise. The place is dated but has new appliances. Note, there's NO aircon, often overlooked when booking even though it's stated by the place. Not really necessary to cool more for the air circulation. Staff is excellent, friendly and responsive. Wonderful cheap cafe on the ground floor with reasonable food. I was in Superior Apartment #11. It was huge, clean, modern and was directly opposite the beach. Amazing view across the pool to the ocean. Perfect for end of August but may be a bit hot in summer with no aircon or insect screens. Easy after hours access and parking. I would recommend to others and would be happy to stay there again. The hotel was situated close to Cavill Ave and the tram station. It was right on the beach and the apartment had everything basic that was needed for a holiday. The cafe attached was very good for takeaways and dine in and there was a convenience store around the corner. Down side...The lifts..they worked sometimes and were very slow...We had to walk up and down 11 flights of stairs on numerous occasions..The staff said it was being looked at but we spoke to some residents who said it was normal. This said I would be concerned if I were elderly or had young children etc . We would recommend it to others if they aren't worried about the lift situation as it would good value for the price. I stayed seven days at the Shore Apartments. The rooms are big and clean with a comfortable bed and every room has a sea view. Next time I would book a room at the front closer to the ocean. My room was at the back and there was some noise occassionaly from the tram and trucks picking up the large rubbish bins across the street. It has been an unusually cold winter at the Gold Coast, the room did come with an electric oil heater but not enough heating to warm the rooms at night. The manager and staff were very good and helpful at all times. The Shore Apartments restaurant has good food, worth a try instead of walking to Cavil Ave every night. The Shore is a good option and less expensive than most other places at Surfers Paradise. I would stay again next time. it has living room, kitchen kabinet and dining area. located juat right opposite the beach and easy access to go to many places. At first when I stepped in, the carpet was a bit dusty. Just a little dusty, not a big issue. I found a blanket kind of thing in the wardrobe and there was a stain but luckily we didn't need to use it. Besides that everything is neat and tidy and clean. Bed is comfortable. Friendly and helpful staff. Beach just located in front of the apartment. And walking distance to get to bars and restaurants and also bus stands where u can access to other places. The best part is i got the change to see the sunrise from my window! Secondly it's also quiet at night. The place is spacious n clean. The staff also friendly n helpfull. The only downside is they dont hv wi-fi services. I went to Gold Coast with my family: 6 adults and 1 child. Rented 3 apartments on the 8th floor. The room assigned for 2A1C was larger than the other 2 twin rooms. but all had awesome views of the sea. However apartments were individually owned, the furniture were different. TV size differs, but all had cable. cooking facilities were good, with all cooking materials provided. I like the security. Need to check in before obtaining access into their private carpark. No room service. We checked in early. Thank the staff for ensuring the rooms were ready ahead of time! Although it was a ten mins walk from the central of surfers paradise, we enjoyed the walk as it was along the beach. The staff was very helpful in everythin that we need. We bought all our theme parks n city view tickets at the reception. Very fast check in and check out. Room was very clean and the ocean view was awesome. Couldnt ask for more. Will definitely return to this apartment. across the road, white sand beach is there. I enjoyed good walking along the beach in the morning and evening during the excellent stay. note: reception is NOT 24 hours. be careful for special arrangement of checking in/out if you plan to be late or early. We stay 3 nights at the shore apartment, it's look so great from our living room, bathroom, bedroom. We can see ocean every way from the window. The apartment was clean, ready kitchen, close to bus stop ocean ave (just next stop of surfer paradise). Walking around 5-10 minutes to surfer paradise & shopping area. I love this apartment so much. Do not judge the Shore by the exterior of the building. On our way to the apartment, we passed many beautiful buildings and many shabby ones. When the driver finally stopped at The Shore, my friends and I were rather shocked to see how old the building looked. However, we were in for a surprise. The room we got, 63, was really nice. Albeit being old, it was cosy, comfortable and clean. It also had a really nice sea breeze and view of the beach. The staff at the reception were extremely pleasant and friendly and always assisted us with everything we needed. The Shore was also a very safe place to stay for 3 girls as no one could enter the premises at night without the key, nor could they enter the lift. This made us feel really safe. The apartment faced the ocean and provided us with a wonderful view as well as constant fresh air. The service provided was impeccable with a friendly receptionist who was always ready to help us with our enquiries. The apartment was also conveniently located near the shopping belt of surfer's paradise and the major attractions and this reduced the hassle of traveling, making our stay more enjoyable. The apartment was also spacious and had all the necessary amenities. Overall, I would say The Shore is great value for money and we truly enjoyed our stay here. stayed here 2 months ago and made a return journey. had a different room but was just as good. big room with seperate bath and bedroom. can easily accomodate 4 people with the sofa bed. apt was clean and great view of the ocean with the sunrise and sunset. all cooking utensils were there for your self cook meals. walk to cavill ave was an easy 10 min stroll along the beach. there is a liqour and convenience store just round the back of apartment building. the shore apartment is the best in the quality of services and good value for the money. the staffs are very nice and the apartment is very clean. each floor has only 4 units so it is very quiet and feel like you stay at home. the view is fantastic as you can enjoy the ocean view and also the mountain view. we had a very good time in the shore apartment. Friendly receptionist at check in and no fuss. Just needed my credit card number and got my keys. Explained to me the security regarding the keys. Building was not the spankiest around the area but was cosy and very clean on the inside. The apt was big with a double bed, living room which has a sofa bed as well and a well equipped kitchenette with a large fridge. I ended up doing a lot of cooking in the apt and found it so comfortable that i did not want to eat out. Beach front was just across the road and had a nice seaview from the apt and could watch the sun rise every morning from my room. The main shopping area of Surfers Paradise was only 10-15 mins walk away. There is a liquor shop and convenience store round the back if needed. There a also a pool and jacuzzi on the outside, beside the Red Cafe but I did not use it though there were some families that seem to be enjoying themselves there Minor points are that they only provided a small satchet of dish washing liquid so I just went to the supermarket and bought a big bottle for 99cents. Coffee and tea were also limited as they do not clean the room for the duration of your stay (except maybe if you happen to stay longer term). These are just some minor setback which did not bother me at all. Overall, was a very enjoyable 'home' for the 5 days I was there. Will be going back again in Aug and will probably be booking here again. This hotel apartment is older and dated, but very clean with a great location. 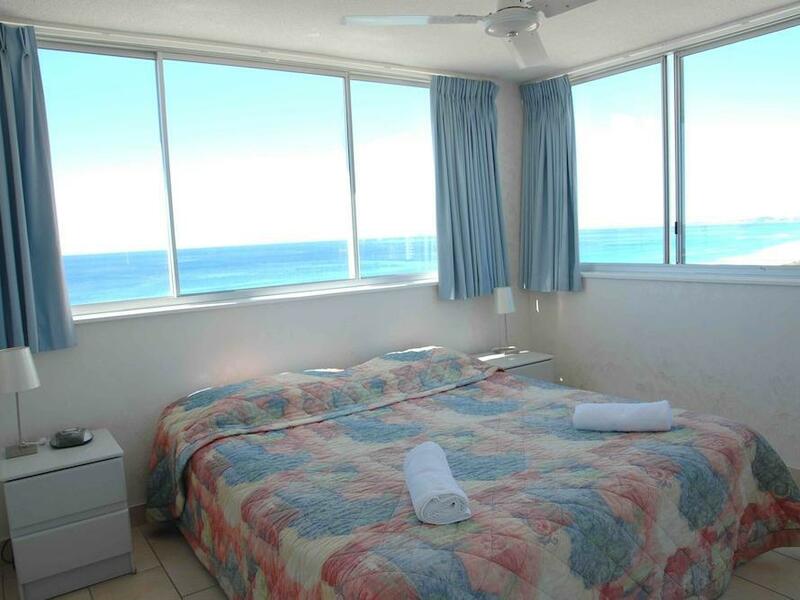 The rooms are quite 1980's, but they are big, clean, and very breezy from the ocean close by. 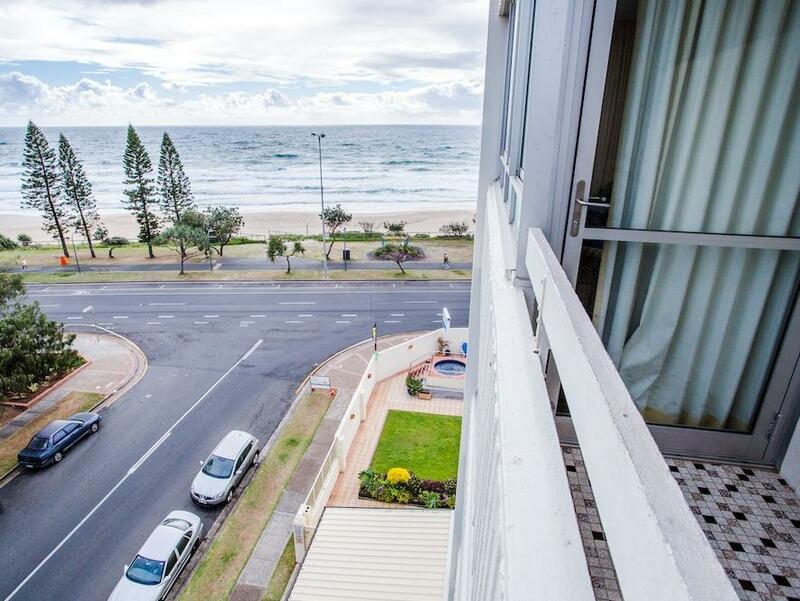 You have a great view of the ocean and can walk to the beach in under one minute. The sound of the waves are very relaxing, and the hub of the city is only a 5-10 minute walk away. We had stayed at The Shore Apartment for a total of 8 days. We really enjoy our stayed at The Shore and will return back if we are to go to Gold Coast again. The room was very clean and the kitchen were fully equip with everything we want to do our own cooking. The bus stops are very near to the apartment and so it is very easy for you to take a public bus to go to the various theme parks. 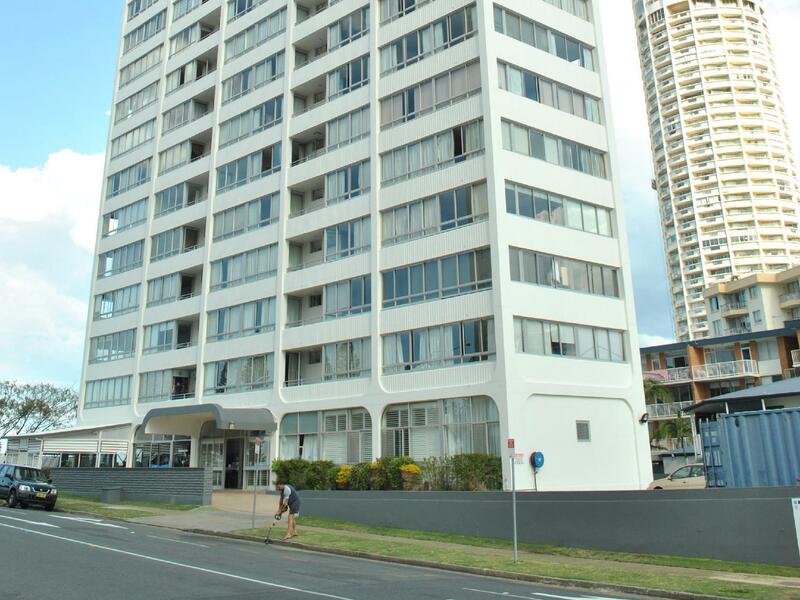 It is also a walking distance to the surfers paradise shopping area. The supermarket is also within walking distance so you can buy the food for your cooking. Yes, there is a swimming pool too! We stayed in room 41 that was quite modern, it face the beach and the walking path. Across the road there is a work out park, so from your apartment window there was the amazing view of the beach and the guys working out ! ;-) This room had no balcony, but the windows are large that when opened it gives you an indoor out door feel. The sun came up quite early around 5am but that was a small price to pay, considering the views we had. The unit although modern there is wear and tear,and you can see the corrosion from the salt air on most of the furnishings. I believe not all apartments have been up graded to the one we had. Nice pool area,with adequate pool and BBQ area that was very clean. There is a cafe at the apartment, I found it a little expensive,especially for coffee. I loved staying here, the location is a 10 min walk down into cavil mall so your out of the noise but still close. Reception staff are very nice, I'll look forward to stayiing again.